There is a ton of excitement around LinkedIn Sponsored Updates, but what kind of results can you expect? Find out what to expect as I review my experience, results, and steps using LinkedIn Sponsored Updates. 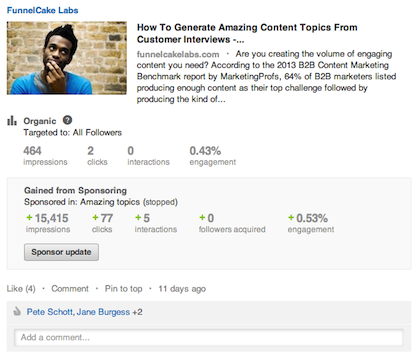 I decided to try LinkedIn Sponsored Updates across three pieces of content and a budget of $733.21. I’ll explain later why my budget is such an odd number. My first campaign was for a blog post, 6 Tips For Communicating Better With Designers. I set a budget of $110 a day. The average bid ended up being $3.27, so I received 33 clicks for my $110. It only took about an hour to get the 33 clicks. During the night the campaign turned back on and went through $96.19 before I turned it off. This brought me to a grand total of 63 clicks for $206.19. 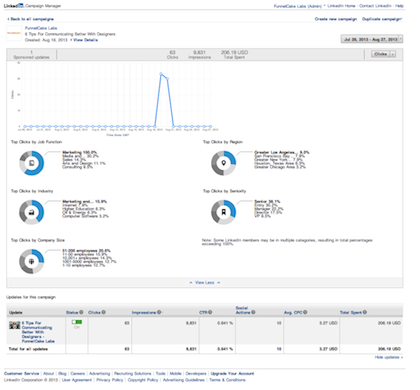 The 63 paid clicks led to 9 interactions. You can see the information LinkedIn provides below. You can find this information below the Update you sponsored, on your company page. The 9 interactions consisted of 6 likes, 2 shares and 1 follower. The 9 paid interactions, likes and shares, led to 756 organic impressions, 4 clicks and one like. I use KISSmetrics to monitor the actions of my web visitors and was able to see that 1 LinkedIn Sponsored Update visitor tweeted the article, 1 LinkedIn visitor shared and one returned the next week. 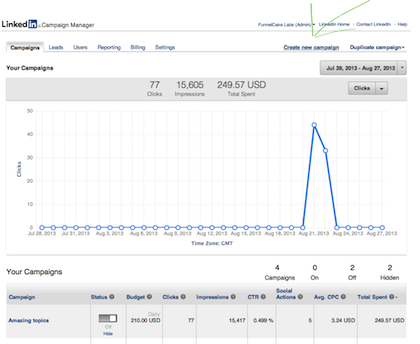 Below you can see the reports from KISSmetrics on the visitor who tweeted the article. You may be wondering, “what about conversions?” This is a great question, but my goal was to increase traffic to my brand new blog. 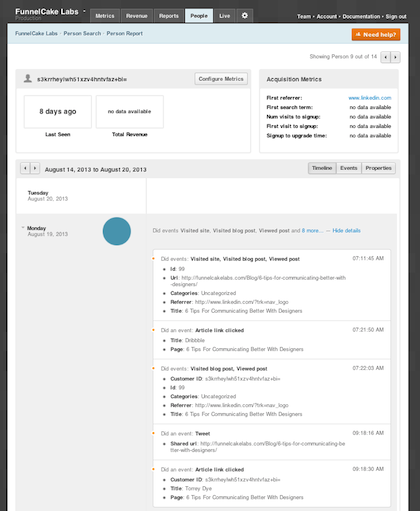 There were no links from the blog to the company homepage for a conversion. The calls to action were only email subscribes and social sharing, and those weren’t even optimized yet. 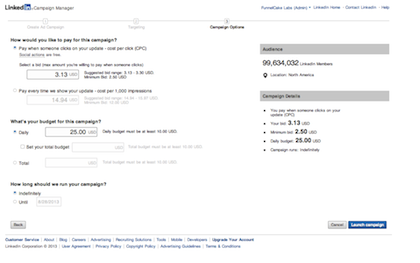 Below you can see the report LinkedIn provides on your campaign stats. My second campaign was for a blog post, How To Generate Amazing Content Topics From Customer Interviews. I originally set my budget at $206.19 to match the previous campaign, but once again the campaign kicked back on at night and I ended up spending $249.57. I received 77 paid clicks, 4 likes and another LinkedIn company follower. The 9 paid interactions, likes and shares, led to 464 organic impressions and 2 clicks for an average CPC of $3.24. 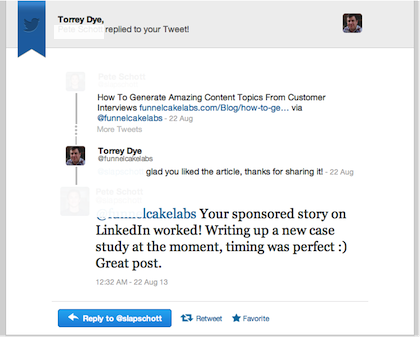 From KISSmetrics I can see that 4 of the LInkedIn Sponsored Updates visitors shared the article, 1 person tweeted it and the person who tweeted it has come back to my site several more times. I replied to the person who tweeted about the article kicking off a fruitful conversation. The person ended up working for Bizo and I’m now testing out their re-targeting service. My third campaign was for a blog post, How To Create Amazing Content From Interviews. This LinkedIn Sponsored Update received 85 paid clicks, 8 interactions, 7 likes and one comment on a budget of $277.45 for an average CPC of $3.26. One visitor shared the article on LinkedIn. I received the highest engagement score, 0.85%, for this ad. The engagement metric is simply engagement (clicks, likes, shares etc.) divided by impressions. I believe this could be a valuable way to test which content people prefer. In this case I may have skewed the results because I added a question at the top. Either way I was surprised to see this post be more successful than the, 6 Tips For Communicating With Designers. 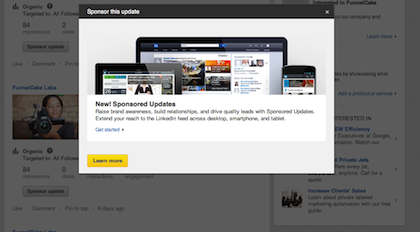 There are two ways to kickoff LinkedIn Sponsored Updates. 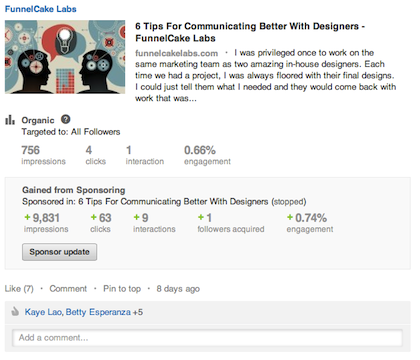 The most obvious way is to click the “Sponsor update” button when you are on your company page. You will need to be an administrator for your company’s LinkedIn page. Although this is the most obvious, it isn’t the easiest. Once you have run one campaign you can shortcut some steps. 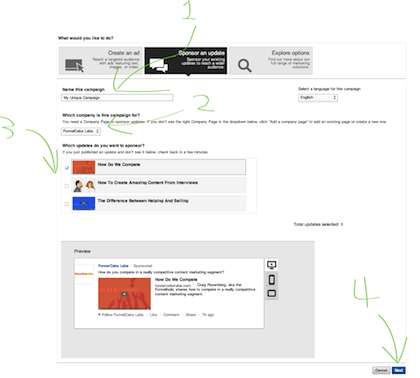 If you have done an ad before you can skip to the next section to learn the simpler way. 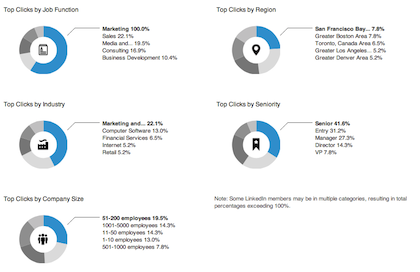 If you have never run a LinkedIn ad then you’ll need to follow these steps the first time. A pop-up will come up after you click the button with learn more. Click the yellow “Learn more” button. 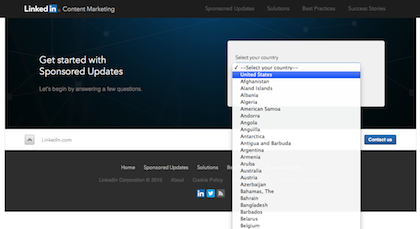 You’re now sent to a page to choose your country and budget. The budget choices are either under $15,000 or over $15,000. I assume that if you choose over it tells you that a sales person will contact you. Go ahead and choose your options. You’ll be taken to a sign in screen. Go ahead and sign-in. You’ll be provided three choices once you sign-in. Choose LinkedIn Sponsored Updates in the middle. Some additional sections will drop down. Give the campaign a name, check that the right company is shown, choose your update and click the blue “Next” button. If your company doesn’t have any updates or doesn’t have the update you are looking for, you will need to go back to the company page and make the update. 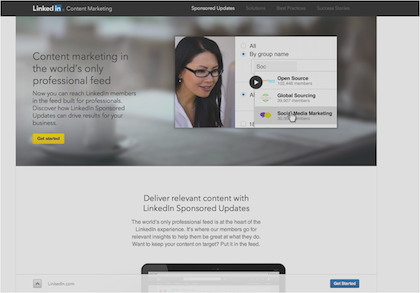 Next you have to choose who your LinkedIn Sponsored Update will target. You can choose to target by location, company name, company size, company industry, title, job function and/or seniority. When you are done click the blue “Next” button. Finally, you choose your bid and budget and then launch your campaign. 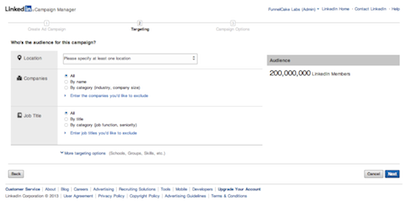 LinkedIn makes it pretty easy to figure out what your bid should be. You’ll be taken to the campaign manager dashboard. Click the “Create new campaign“ link. This will take you to a new screen providing you three choices. Choose LinkedIn Sponsored Updates in the middle. Some additional sections will drop down. Give the campaign a name, check that the right company is shown, choose your update and click the blue “Next button.” If your company doesn’t have any updates or doesn’t have the update you are looking for, you will need to go back to the company page and make the update. 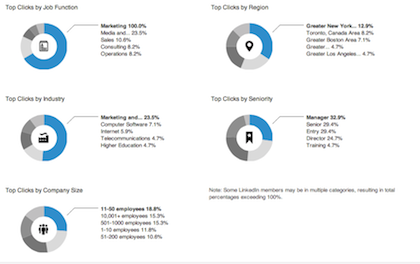 Next, you have to choose who your LinkedIn Sponsored Update will target. 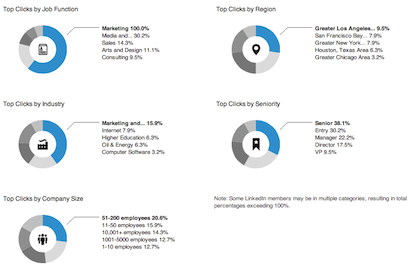 You can choose to target by location, company name, company size, company industry, title, job function and/or seniority. When you are done click the blue “Next” button. I did find it to be an easy and fairly inexpensive way to target and attract relevant readers for my brand new blog. I like that I can get a sense of how people feel about my content before I have a built in audience. I think it is valuable to be able to seed some social sharing for a small cost. What is the final verdict? I don’t think I have enough information to know. Not enough time has passed to see how many visitors return and what they do when they’re back. My site hasn’t yet been optimized for subscribers, social sharing or conversion. I don’t know My Life Time Value of a customer of Cost of Acquisition metrics yet. 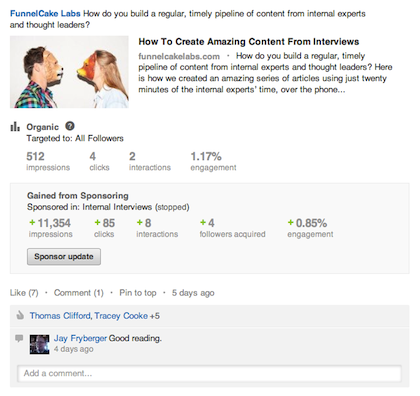 How about you, do you think LinkedIn Sponsored Updates are effective? Thanks for your great insight into LinkedIn Sponsored Updates. I’ve been thinking I need to give them a shot and your post lays out some really good tips. Carolyn, Thank you for the comment and I’m so glad you found the article helpful. Very good info! Especially helpful to know what your goal was at the outset and how you think this effort moved you along toward it. Chris, thanks for checking out the article. I’m glad that providing you the goal was helpful. I was worried that not being able to provide information about conversions may hurt the article, but thought there was still value in reading about my experience. Thank you for this overview, Torrey! I am trying to get my very small company to give me marketing bucks for sponsored advertisements. I am pleading my case in an upcoming meeting and this will help me a lot. Kelsie, I’m pleased that I could help out. You may want to also look at StumbleUpon Paid Discovery and Reddit Advertising. They aren’t right for every industry but you typically can get 1,000’s of targeted visitors for under $200. Let me know if you have any other questions and good luck at your meeting!